If you are looking for some coverage for your larger outdoor space the Galtech 10' x 10' square offset patio umbrella will work beautifully. Enjoy your outdoor gathering comfortably underneath its generous shady span. With its powder coated aluminum pole this umbrella is both sturdy and durable and able to handle the harshest weather elements. The exclusive Easy Open Lift system allows you to open and extend the cantilever arm in one simple motion with ease and the tilt wheel enables the umbrella to be set at any angle and in either direction by rotating the handle up. A 75-pound resin base that can be filled with up to 100 lbs. of sand and gravel (not included) will securely hold your offset umbrella in place. Choose from an array of premium Sunbrella and Suncrylic fabrics in a variety of colors that is sure to compliment any outdoor setting. 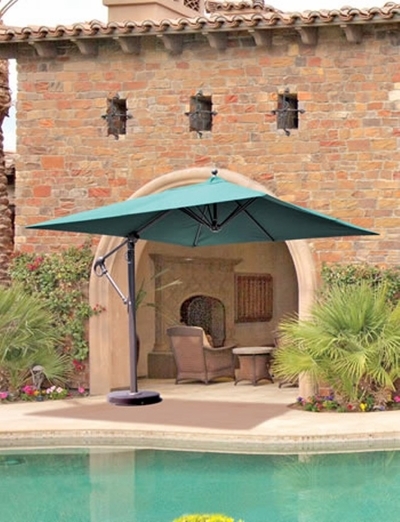 This is an exquisite patio umbrella this is as attractive as it is functional, a stunning addition to your open-air space. * Shade Size: 10 x 10 ft.
* Weight: 75 lbs. - unfilled base. 175 lbs. - filled base.